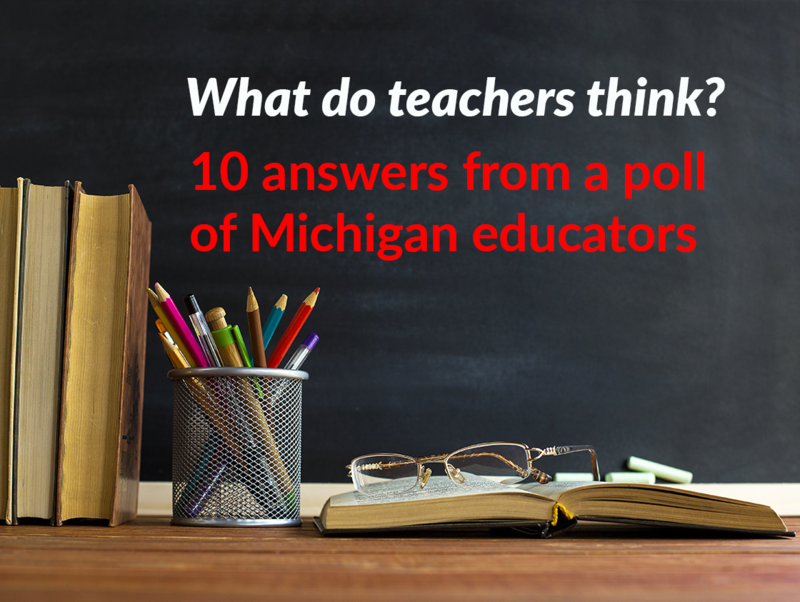 SLIDESHOW: Michigan teachers bemoan the influence of standardized tests as a driver of education policy in the state. Instead of providing more support for third graders after they fail, why not provide the support in 1st and 2nd grades BEFORE they fail? Michigan's schools have spent an extra $800 million/year over the past 3 years to do exactly that. So far, 3rd grade reading scores have dropped for the past 2 years. A large part of the problem is that too many teachers don't use or don't know the method of teaching reading that works best for most students. 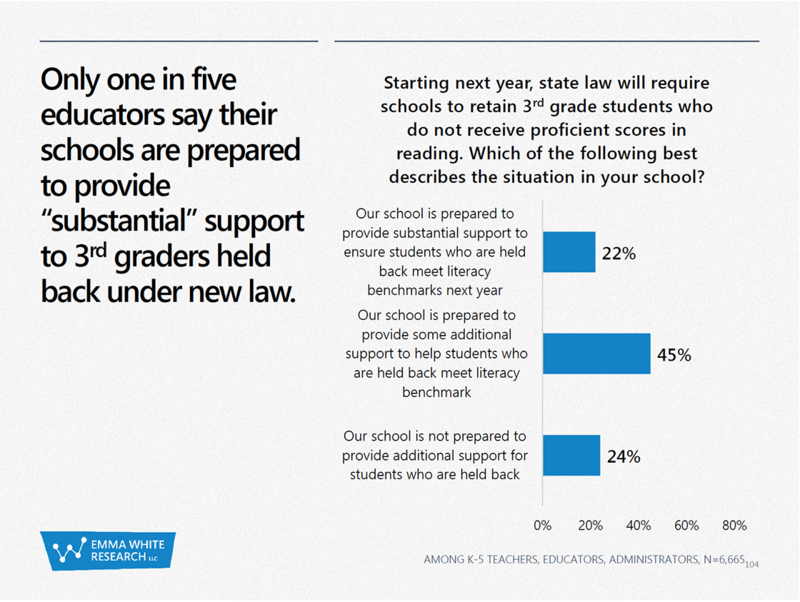 Check out Chalkbeat for information on what's been done in Colorado because of a similar "reading by 3rd grade or retained" law there. The second problem we have in Michigan schools is the ferocious insistence of education authorities that students be assigned to classrooms by calendar age, rather than by what aspects of learning they have mastered. 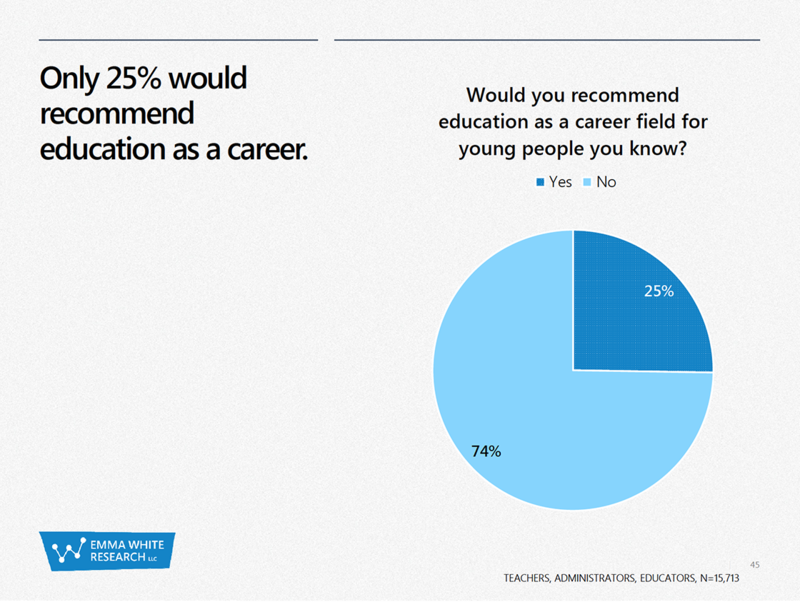 That means many teachers face a 3-5 year range of skills and knowledge in each classroom. That makes it very hard to provide instruction that suits the level of all the students in the room. It makes some sense to start every kid together for their first formal schooling in pre-K or K. But the school entrance criteria should not be calendar age, but skills, knowledge and behavioral maturity. After that initial semester or year, students need to be taught both reading and math at their "challenge level", not with randomly assigned age-mates. Those kids who are behind age expectations in either reading or math need smaller group instruction with lessons geared to the level they are at, not to sit through material that's over their heads because they haven't mastered earlier lessons. Have you given any consideration to the social development/maturing of the students? Are you sure a student 12 or 13 year old that has the academic knowledge of a high school senior is socially ready to be put into a group made up of 17-19 year old adults everyday, all day? If there is an academic progression for students, why shouldn't we believe their is a social progression for each student and why shouldn't it have at least an equal weighting when structuring school for students? Time and again research shows that a child at the late stage of a cycle [an October baby is measurably behind a January baby] though out their developmental years. Why do you think multiple choice test results is the best measure of a students development and how to make decisions that can affect them for the rest of their life? I have given a great deal of consideration to the effects of social maturation on the school environment, especially for students who vary significantly from the average. I have both first-hand experience of what being a 12 or 13-year-old with the intellectual and academic knowledge of a high school senior and have now-adult kids with similar intellectual gifts. In the case of my children, their school lives were complicated by their also having specific learning disabilities with written expression that made it harder for them to demonstrate their skills and knowledge to their teachers. All of us where withdrawn from our neighborhood schools by our parents at some point during our K-12 years because of extensive bullying related to intellectual giftedness that was not controlled by the schools. In three of those withdrawals, the bullying was from a teacher, and in all of them, the school administration did nothing effective to promote greater safety for atypical students. Note that one of the school withdrawals in my own case was triggered by my defense of a student with moderate cognitive impairment against bullying and a physical attack by a "popular" queen bee girl. What makes you think that encouraging all students to learn at their own pace is less important to their balanced development and quality of adult life than having classmates who approximately match their emotional and behavioral maturity? What makes you think that typical older students won't use their greater emotional and developmental maturity to support and befriend younger students who are their classmates and intellectual peers? That was the experience of both myself and my kids when we entered and throve in both academic and hobby-related programs intended for older youths or adults while still in our early teens. It took putting my kids in a charter "early college" high school, but I am SOOO thankful that the opportunity was available in my county . I want a a system that makes an "all you can learn" buffet of instruction available for all Michigan's kids in their neighborhood public schools. I want every kid to be taught, including socio-emotional learning lessons, using instruction targeted at approximately the level they currently are at in each subject area. It just isn't practical to expect teachers to create differentiated lessons for the 3-5 year spectrum of academic achievement in classrooms that are grouped primarily by calendar age, possibly with a nod towards racial/ethnic or socioeconomic diversity within the school's population. Nor is it reasonable to assign a student with recognized severe disabilities to a class-level based on age for subject-knowledge instruction OR for standardized testing. Michigan law provides students with disabilities with education through high school graduation (not certificate) or age 26. We should use ALL that time to teach students with disabilities at their level, as far in the curriculum as they can master. What we should NOT do is warehouse them in the backs of classrooms in the name of "inclusion" and keeping students in lock-step with their age-mates, rather than their peers. I do not believe students should be encouraged at the same pace. The advanced place course are an effective tool for students to be challenge bases on their subject of interest and their learning abilities. There is also programs where student, even in elementary schools, to take specific subject classes with other grades [a 5th grader taking and algebra class with 7th graders] while staying with their age group in homeroom and classes that are grade specific such as health and physical education. Such an approach challenges the intellect while not creating a social pressure beyond their age. My experience has been that the frustrated old kids tend to try to compete, pressure the younger kids. This is especially apparent when it was include sexual maturity/experiences/puberty. My greatest concern is the long-term residual impact when sexual contact/confrontation. During the middle or high school ages the kids are more self-absorb in their date to date activities, and reaching out to help others is more driven by unusual events, when a stressing confrontation has occurred. And if you add in the social and religious expectations by parents being different for the students age, that can exacerbate the stress. A 16 year old has different interests outside the classroom than a 12 year old and that is the time that when the impact is greatest. Dating can be a significant event and topic of conversations, 12 year old is not a peer with a 16 year on a date, physically or emotional. I would encourage and evaluation of the emotional and academic levels for each student and match them appropriately. I surely don’t believe in ‘warehousing’ any setting, but for those students who may not be able to keep pace academically can still develop and grow socially while attending the specially focused classes. I think we are more aligned that it may appear, I think the difference is how we consider the whole of the student’s development, the difference as little as 6 months can have an impact on the younger student. Standardized tests must be required otherwise how can we assess how students and schools are doing. Ignorance may be bliss for school administrators, but parents and the paying public need to know what's really happening. Could standardized test results be made more useful to teachers - probably. 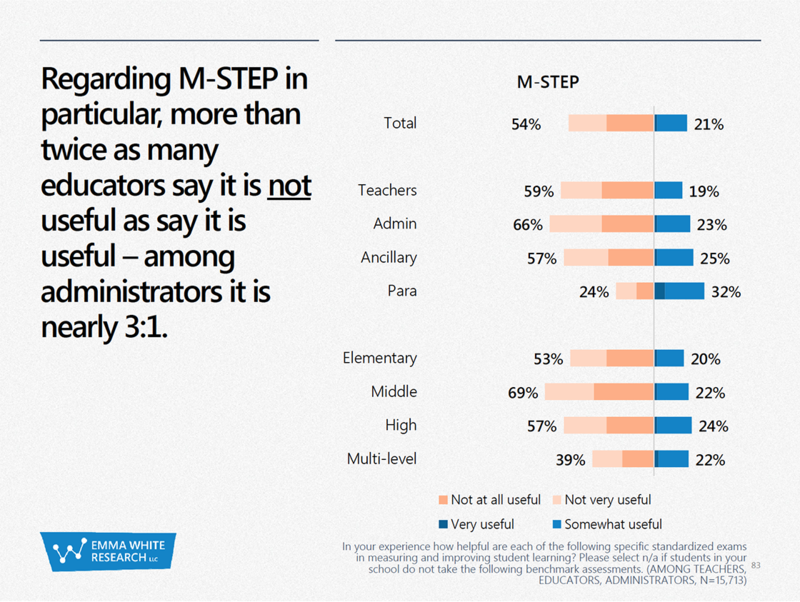 Is M-STEP a good test - perhaps not, but we need something. Like medical tests, standardized tests are generally disliked. And like medical tests, they are very useful and must not be abandoned. I am curious why you insist "we need something" and they "must not be abandoned". Your attachment to testing when it has not proven valuable is a mystery to me. Sometimes you need to listen to the "experts" instead of listening to those politicians who think they are the experts. All you have to do is see the devastation of our current educational system. Bernadette, I am curious is there any reason that you see that students should be required to show their attainment of the skills and knowledge we've determined necessary to functioning in today's world? If so, should should this be developed by an outside authority or left to the teacher or school responsible? MDE’s Assessment Transition alludes to the difficulty of developing this new assessment system. According to this document, assessment development is typically a three-year process, but the school aid budget passed by the legislature in June required that the process be conducted in nine months. Needless to say, MDE resources were strained in order to meet this deadline." Anyone who has ever been involved in testing knows how difficult it is to create these tests. Who actually benefits? This is a top down mandate from legislators for testing, demanding development of the tests, but not validating the tests, and then doubling down on the results. Who benefits financially? Probably the friends of the legislators who have some financial interest. Who suffers? OUR CHILDREN, who are also our future. I just wish some experience and common sense were used. I agree with you about the top down setting of the testing is the poorer way to develop performance metrics. The problem is that teachers , instead of developing performance metrics for the 'education system' before any outsiders start asking for one they have simply hid from it and then began the full out resistance to educational/learning performance metrics. The best people to such metrics are those who have the necessary knowledge and skills and apply it everyday. And yet to this day, all we hear from 'teachers' is how bad the system is without ever offering an alternative scheme for verifying performance. We hear how it is all about money, we hear how it is the 'wealthy' districts, but we never hear what the metrics should be, how they should be applied and the data gathered. If the 'teachers' want to change the 'educational' metrics then they should start with a blank page, develop their own, and then provide it to the public as an alternative/replacement. I would encourage they identify a few districts to use in parallel with the current scheme to gather data demonstrating its accuracy as performance metrics. Duane, I've read enough of your comments over the years to know you don't have much to offer either. 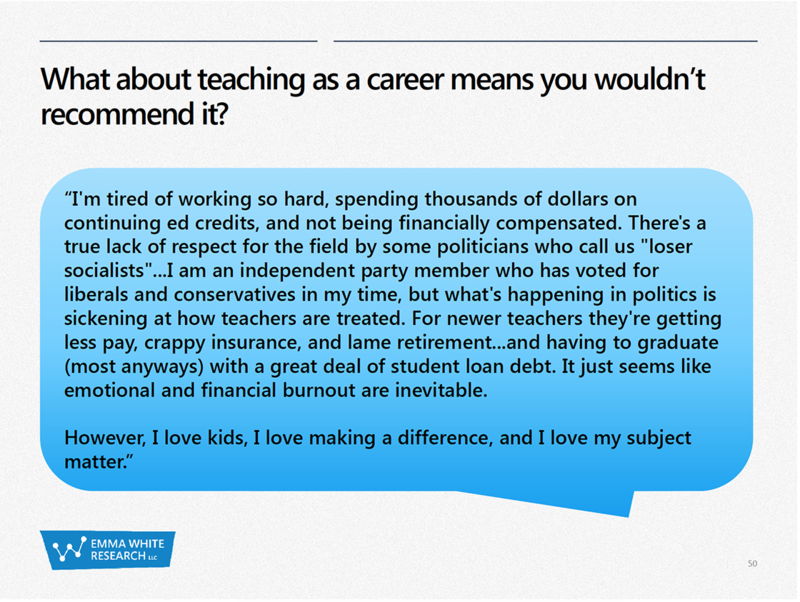 Going after teachers with "teacher" is insulting to them and their profession. You are nothing more than a Monday-morning quarterback that spends way too much time on these forum pages which leads me to believe you aren't here by accident. There clearly seems to be ulterior motive with your obsessive posting especially when it comes to teachers. So to fight the possible impression that teachers are thin skinned and lack of content, what is your solution to measuring students' skill and knowledge attainment? Who should do this and what should be done if a lack of success? I am here because I like the comments, they provide a diversity or perspectives which causes me to think, and Bridge provides a place to articulate my thoughts for others to read and that makes me think. I have found that value of thinking, the value of diversity of perspective for facilitating thinking differently about an issue/problem, the value of articulating to help one clarify their thinking. There are two distinctive ways to look at teaching, the role of teacher and the other is about the individual teacher. I think all of us should regularly reassess the roles and their responsibilities and even their methods to ensure they aren't chained to the past and not adjusting to the future needs. Having had the responsibility for helping [teaching] others to gain the necessary knowledge and skills to retain their jobs, especially when they had no experience with the new technology, I have gained a better appreciation of the teacher/role/impact. As for the 'Monday-morning quarterbacking', in reality that is the only way things change and we learn and leverage what we learn to help other to improve. If you have never had responsibility to change practices/protocols to improve performance [even survival], to change thinking, you haven't learn how important questions are then I would encourage you think about how change happens, what triggers it and what facilitates the thinking of change. If I were to distill my view of teaching I would equate it to coaching, introducing topics, explaining the details and application, and reinforcing practice. As for my excessive posting on education articles, it comes back to my personal experiences from living in a government project, with conditions controlled by others, to gaining control of my life, my choices. Learning gave me an appreciation of science [in our everyday lives to being compensate fairly for applying it]. I have watch how education had given our daughters choices and control of their lives. Thank you. I have no opinion about any specific test. The problem I see is that problems you mentioned will be intrinsic to every test but this fact should not lead us to no testing. I'd expect that their development will be a long warty never ending process. The impression one gets is educators don't want any tests and leaves one wondering why? We, as individuals and as organizations, improve only what we can measure. By establishing metrics we have a means for focusing our individual efforts and the efforts of others. Sometimes rather then listening to the 'experts' it is better to listen to those succeeding and asking why and how they are succeeding. The reality is that people and organizations are similar in nature and the contributors for success and be leveraged across functions and disciplines. Why are you so sure the 'education system' is so devastated? Don't you look around and see thousands of students graduating each year from Michigan school that are going on to academic success at top universities? With such individual and collective success, how can you be so sure that the 'education system' is in such a bad state? Rather than putting all your attention on the disappointments it maybe better to invest energy and effort in identifying and understanding the successes, then sharing that success across the 'educational system'? So, the tests may not be very good, or tell us what we think they are telling us, but we need them to know if our children and schools are doing well. Even if they aren’t doing that. Because medical tests exist. Just because you spent time in a school doesn’t mean you understand how testing works...or doesn’t. I find it fascinating that this whole article described how professionals felt about testing, and you are convinced that all of them are wrong and you’re right. And we wonder why so many teachers wouldn’t recommend their own children follow them into the profession. The article you just read explains that the teachers, who've actually studied education and testing, feel that standardized tests DON'T accurately assess what students and (even moreso) schools are doing. They don't work, at least in the way we're trying to use them. And about the only people who claim they do are the people selling the tests. Data absent context is meaningless. Standardized test scores and the tests themselves, by design, ignore context. That can be said to the point of paralysis, leaving the impression that the point is to avoid accountability. Other countries (Finland for example) do not rely on standardized tests to assess student progress. What they do rely on is teacher produced assessments based on the content they are teaching. That way the teacher can see where gaps are occurring in attaining content and skills on a individual student basis. Then, that way, specific methodologies and techniques, hopefully evidence based, can be implemented to see if content and skills are obtained. Then further testing can confirm this. Standardized tests are administered later on as a way to predict competence and aptitude for further education to be parsed out between students. This makes so much more sense to me compared to blanket standardized tests that are given wholesale. Students develop individually and at different rates. We must bring up the bottom, not just know that there is a bottom of the pack. These standardized tests do not give feedback to know who and where pedagogical techniques should be applied to those who are not on the mark. This is especially important for the third grade reader law. Well ypu know teachers. They are idiots, don’t what they are talking totslly self indulgent and get paid way too much money. Replace them all. 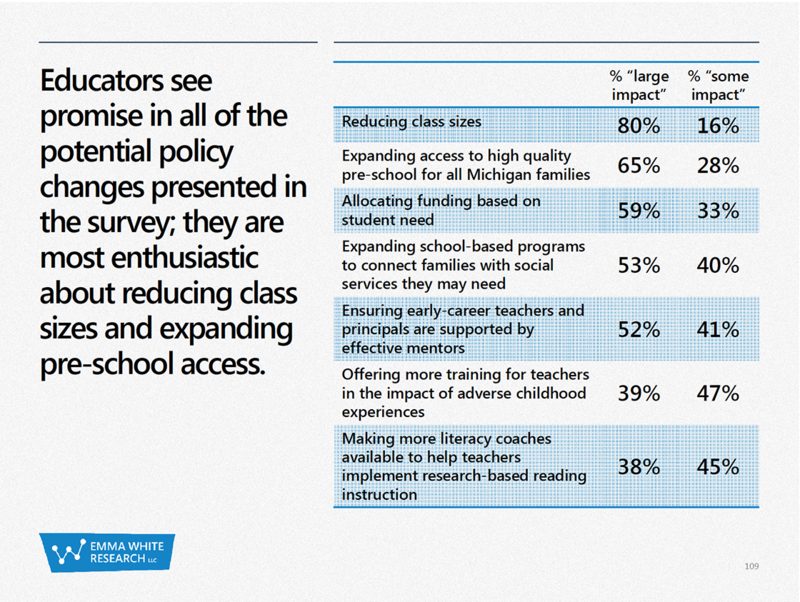 Michigan Teachers: Keep lowering the bar. They are only required to lower the bar to meet the standards of intelligence of the Mi Congress. The very fact that there is a huge percentage of the US population that do not recognize/agree/comprehend that the value an educated population brings a strong economy, secure border, and a higher quality of life. This is a very scary notion and in its wake the Fall of Rome. Thank you Bridge for this enlightening article. I have believed for a long time the teachers thoughts and opinions needed to be considered. This article is no surprise and those on the front line have the best vantage point to identify real problems and real solutions. What Michigan needs to learn is that collaboration and dialogue are the two most important skills for 21st century work. The Launch MI group sounds like a step in the right direction. What a novel idea - asking the people in the profession what they need to do the job! If we are unwilling to fund our schools adequately then we are leaving ourselves open to a disadvantaged future. 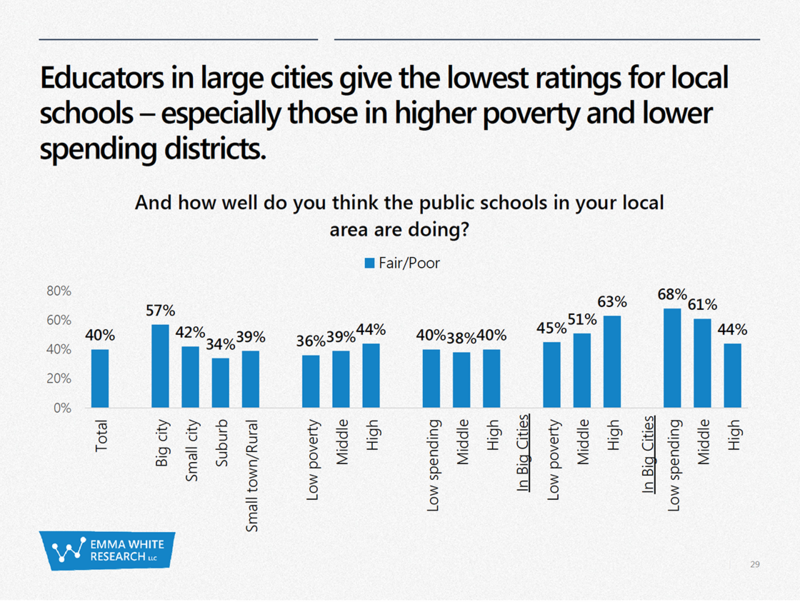 Quality public (and I do mean public) education is fundamental to our democracy and our economic well-being. Let teachers be free to teach and use the methods that work best for them and their students - not teaching to a standardized test. Pay them well, respect the profession and parents take the teacher's side in disciplinary matters. Chances are your kids is not as perfect as you think they are. You weren't, I wasn't, but I knew when I acted up my parents were not going to protect me from discipline at school and there would be more at home. I know that sounds "old fashion" but some things never go out of style. I expect most of us have a teacher who changed or impacted our lives for the better. That is worth the investment for every generation to come. This parent/grand parent has long agreed with the teachers who say the standardized tests are useless, but will go further to say they get in the way of actually learning critical skills. This parent/grand parent agrees with James F Bish. Thank heavens there were no standardized tests when I was in grade school. And we all did fine when we got to the SAT. That is a bold statement, can you describe how it gets in the way of learning? First Rule! Poles are not news, we can always find significant numbers of people who will believe almost anything. This is far from making something a fact. Teachers are largely a uniform political group with a very active union pushing a political agenda to its members that largely coincides with this poll. No surprise! First Rule! If you want to spout Fox News talking points, you need to learn to spell 'Poll'. Second Rule! When you don't know what you're talking about it's best to remain silent. Mark Please specifically point out my error (not the spelling). If there is one. Or we'll assume that truth hurts and this is all you can come up with? Finnish students always place at the top or near the top in international educational testing. They experience standardized testing a grand total of once in their total school experience. Umm. More testing needs to be done - not less - this is obvious from the results of the poll. Testing should be the centerpiece of the educational experience. Children, upon entering each grade level should be thoroughly tested to determine where those children are in their education. Then a gap analysis for each student, each classroom, each school and the entire state should be prepared, and learning objectives modified to yield students at the proper level of education by the end of the school year. Additional state-wide tests should be run at the halfway mark and at the end of the school year to monitor achievement of goals. Now, of course , this means that ALL of the state testing must mirror the state-wide learning goals and objectives, and that the school and classroom learning objectives must match the State-wide learning objectives. Testing in this manner will locate failures to achieve goals and objectives and single out individual students, teachers, or schools for additional attention. Once this system is up and running across the state, and working as it should, then the learning goals and objectives can be raised, year after year, at sustainable rates to achieve, not A, but THE world class educational system. The system requires setting of proper goals at the state level, and development of learning objectives and tests that tightly agree with those goals. It will require feedback systems for schools, teachers, and students sufficient to modify behaviors at each level as necessary to allow each student to achieve at the desired level. This system will become much easier to administer when the state makes the choice that everyone knows they have to make but everyone is afraid to speak about in other than hushed tones: prepackaged, computer and video based lesson plans must be used to give every classroom access to the best learning methods and to the same learning experience. Highly experienced teachers, college professors, and business and community leaders must be brought in to a state run studio setting and videoed presenting class materials with blackboard being pushed simultaneously on computer systems. These materials should consume at least 80% of student classroom presentation time. This will reduce the cost of education significantly and allow production of extremely high quality instruction systems. Reciprocal agreements with other states will expand the base and reduce the costs of these materials. The goal should be that all new material (or first time instruction) should be presented through computer and video. I'm wondering whether this is someone who doesn't understand anything about education but has bought the corporate "reform" sales pitch completely, or a brilliant SATIRE of someone who doesn't understand anything about education but has bought the corporate "reform" sales pitch completely. It's so overwhelming it its wrongheadedness that I'm leaning toward the second. And if so, I agree with the tacit, underlying point: doing what's suggested here (hopefully tongue-in-cheek) would be a great way to completely destroy quality education. Learning is not a mass production endeavor. Grade level, test score goals, proficiency tests are all based upon arbitrary targets established by organizations dedicated to self preservation, not learning. View the Ken Robinson video, "Paradigms" to understand the fallacy of what you propose. Technology is already changing education, see www.khanacademy.org. Take a course from one of the colleges or universities that offer on line content. Currently funding control is under a very diffuse means of control as indicated by the question even being asked of where funding priorities should be set. Neither legislators, not local teachers should have more than an advisory role in determining where money is to be spent in schools. This function should be assigned by our constitution to the state school board (board). The first step is for the board to establish overall learning goals and priorities. The board must establish a model of what a properly educated young adult graduating from high school looks like WRT skills and knowledge. The board must then incrementalize these skills and knowledge to each level - either by grade, or by school (Primary, Middle, Secondary). Using testing, the state must perform a gap analysis on each school, and then slide resources as necessary to allow every school to eliminate the discovered gap. Resources will shift every year as the gap analysis uncovers the needs; this fine tuning of resources will also fall to the board. The board must go to the legislature each year and offer up to the legislature two or three levels of achievement for the following year and the funding necessary to achieve that level of achievement. The Legislature should then fund the board accepting their responsibility to the people that the funding provided will only achieve the level of achievement funded. The board should have complete authority and responsibility for the disbursement of those funds. Your proposal will fail miserably because every study that has ever been done on education efficacy shows that spending on education, past a certain fairly low minimum of providing a basic building, an adult supervisor who knows at least as much as you expect the students to master about a subject, and access to learning materials (books, writing tools, videos, materials for making things or performing simple experiments) is not what determines student academic performance. Spending more money on schools will not, absent other changes to the school system(s), make a significant difference to how much students learn. Parents can teach their children phonics and reading everyday. Where is that Lottery money going. It should be for schools ONLY. Gretchin needs to cut the fat not add more tax. I recall a lecture by Ken Meier who led a project studying Texas' educational system. The research identified five things that work: hard work (homework), high standards, stable curriculum, parental involvement, experienced and capable administrators. Teachers like other professionals should pay attention to evaluation research that identifies best practices. Standardized tests, unfortunately, can interfere with the educational mission of the schools when teacher incentives are aligned to teach to the test. 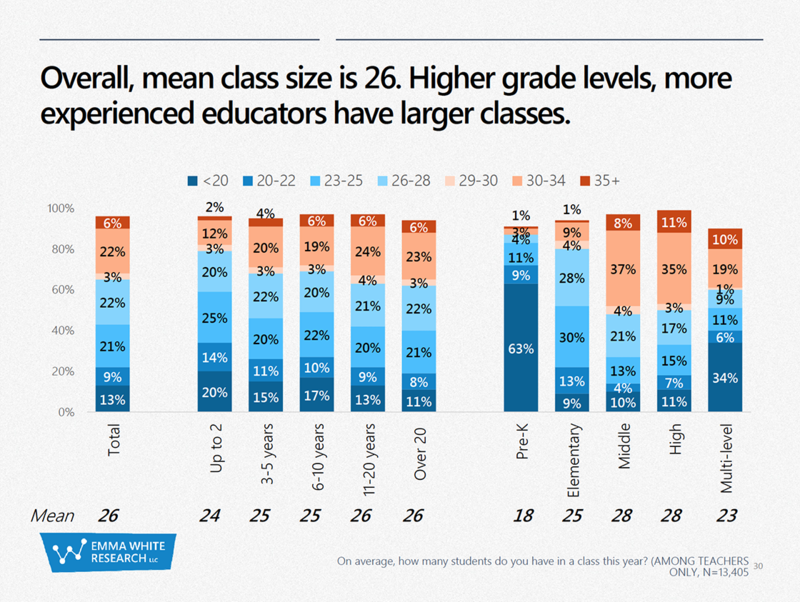 Research shows that class sizes matter in the lower grade levels. We can learn from other countries, such as Finland, that have gotten things right. A complete audit of the secretary of state must be done before any consideration of the tax and spend Gretchens new taxes.Audit now!!!! Just a thought. Maybe some students do poorly on tests is because they can't read well enough to understand the questions. Look at multiple intelligences and see it is not how smart you are but how you are smart. We all learn in different ways. Yes we must concentrate on reading skills but ask some questions of the child being tested and see if they know the answers. Just a thought. Love to hear. R.L. Literacy coaches are not the answer.